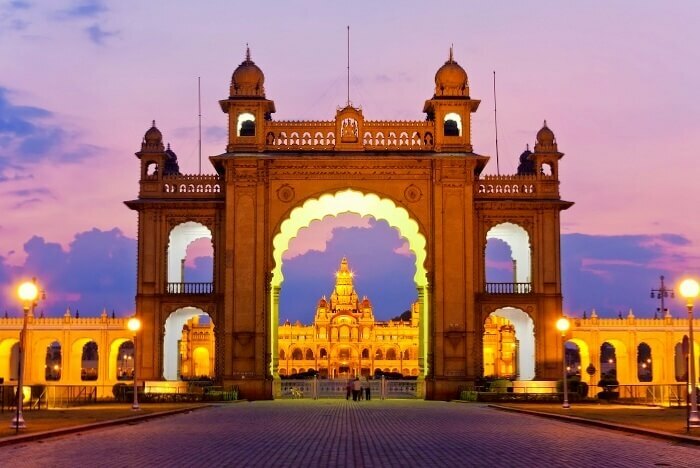 Mysore palace: One of the most important and beautiful palaces in India is Mysore palace. Mysore palace also known as Amba Vilas Palace is located in Mysore district of Karnataka in South India. It attracts millions of tourists every year. Mysore is located at the foothills of Chamundi Hills is also known as cultural capital of Karnataka. There are many touristic places in and around Mysore. The city has 7 palaces and is also known as city of palaces. The city is famous for the celebrations of Dasara festival which is called as ‘Nada Habba’ meaning the festival of the land. Mysore is not only famous for its touristic places but also for food, festivals and Mysore silk saree. 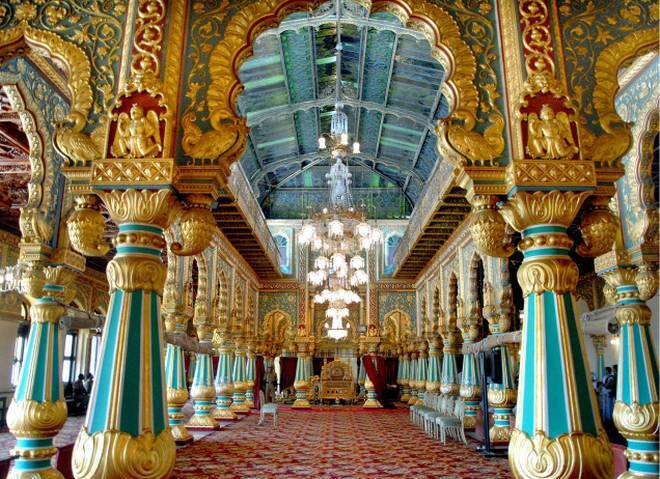 Let us understand the history, architecture and the rulers of Mysore Palace. Mysore palace was earlier built in wood. But it was burnt down completely during royal wedding in the year 1896. Hence Krishna Rajendra Wadiyar ordered for the restoration of the palace in the year 1897. British architect Lord Irwin was authorised to construct the new palace. The construction of the palace was taken care by BP Raghvalu Naidu who was working as executive engineer. The construction was completed in the year 1912. The construction cost was close to Rs. 4,147,900. Until the construction was completed the royal family was put up in the Jaganmohan Palace which is located closely to the Mysore palace. The grand Mysore Palace which we see now and which is world famous was constructed only in the year 1897. The Palace was further renovated in the year 1930 which included the Public Darbar Hall. The royal Mysore Palace which used to be the residence of the royal Wadiyar family from 1350-1950 has been built and renovated several times to keep up the beauty of the palace. The kingdom of Mysore was ruled by the Wadeyar dynasty from 1339-1950 with a brief interruption when Hyder Ali and Tipu sultan were in power. 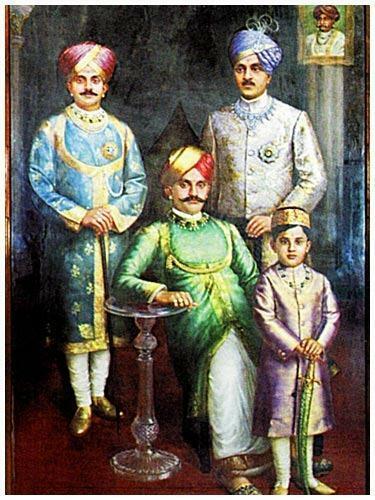 The Wadeyars were Yadhavas who ruled Mysore for 600 years. Yaduraya Wadiyar founded the Wadeyar dynasty in the year 1339. Yaduraya Wadeyar ruled Mysore under Vijayanagara Empire until 1423. After him many kings succeeded him and ruled the Mysore city. The palace is adorned with various arches all around. The sculpture of Goddess Gajalakshmi is placed above the central arch. There are three temple buildings in the old fort and 18 within the palace. The palace is facing Chamundi hills where Goddess Chamundi is present. The Wadeyars are great devotees of Goddess Chamundi. The palace consists of two durbar halls and gardens, rooms and courtyards. The central part of the palace is a big open court. The central part of the palace is the huge court next to it is the royal marriage hall. The palace is surrounded by beautiful garden all around making it a beautiful place to spend quality time. The main and the important attractions at the Mysore palace is the Golden Royal Elephant Throne, the Durbar and the Kalyana Mantapam or the wedding hall. The elephant gate which is the main entrance to the palace is fully decorated with different floral designs and also has the Mysore royal symbol of a double headed eagle. The Durbar Hall has beautiful intricate carvings on its ceilings and pillars. Mysore palace has many attractions inside it. Some of the famous are the paintings on the wall of the Palace. The beauty of these paintings is as we move we feel that the painting is looking at us. These paintings which mesmerises the tourists are present mainly in the Durbar Hall. The credit for these painting goes to Ravi Varma. This is one of the magnificent and most famous places in Mysore Palace. King used to conduct different meetings here. The hall is decorated with beautiful wall paintings, large mirrors and marble floorings. Another important attraction is the Golden Throne which was used by the rulers of Kingdom of Mysore. Now this throne is displayed to public only during Dasara festival . The private Hall or the Amba vilas hall is a place where king used to hold his private meetings with ministers and some other important dignitaries. The hall is beautifully decorated with candillers and paintings on the ceilings. The entrance door which is a masterpiece is carved with beautiful designs. The door is made up of rosewood. Some other important places in the palace are Kalyana Mandapa which is octagonal in shape with glass ceilings. One cannot miss any thing in the palace. It can be the Diwan I aam or even the Doll house. There is another important place where all the arms used by the kings are displayed to the public. It mainly contains weapons like pistols, cutlasses etc. The palace includes 12 Hindu temples which were constructed in 14th century. The oldest temple was built in 14th century and the latest temple was built in the year 1953. Some of the important temple that are present in the palace are Someshvara temple of Lord Shiva, Lord Vishnu temple known as Laksminarayana temple and temples of Lord Krishna, Goddess Gayatri, Goddess Bhuvaneshwari can also be seen. When you visit the palace don’t miss the light and sound show which happens in the evenings. It is just amazing and beautiful to watch. Every day the whole palace gets illuminated from 7:40 to 7:45 pm and during weekends, national Holidays the palace gets illuminated from 7pm to 7:45 pm. The sound and light show takes place every day except Sundays and other national holidays from 7pm to 7:40 pm. The entry charge for the show is 40Rs for Indian adult and 25 for children. The charges for the foreign nationals would differ. Mysore is well connected by road, air and rail from Bangalore and other major cities of India. One can even hire a cab from Bangalore. The drive is close to 3hrs. Mysore has many tourists’ places. There are many tourists places around Mysore. Some of the important places around Mysore are Ooty, Kodikanal, Srirangapatna, Kabini river, Nagarhole National park, Bandipur National park and many more. One can plan well for a week’s trip to Mysore so that they can cover all the places. 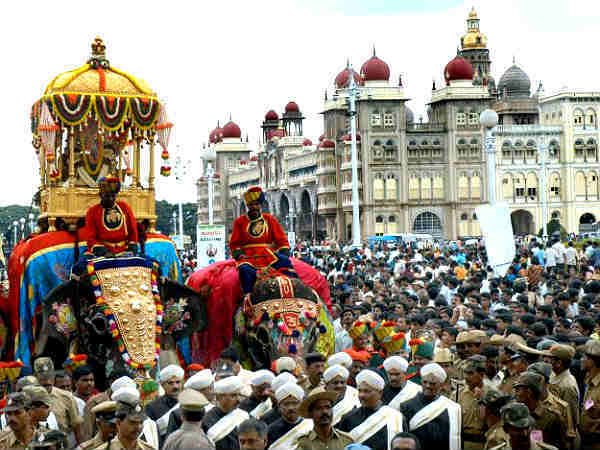 Best time to visit Mysore is during Dasara Festival in the month of October. The 10 day celebrations are world famous and many cultural activities takes place during this period. The whole city gets illuminated. Otherwise also Mysore is a touristic place that can be visited all through the year. The weather is not harsh either during summer or during winters.